To have three local dramas from SBS in a calendar year is something of a bonus, given there was a time not too long ago when we had zero. On the Ropes from Lingo Productions plants itself in Western Sydney’s Iraqi-Australian community and the world of boxing. Not about to get bogged down in stereotypes, its central character is female boxing instructor Amirah Al-Amir (Nicole Chamoun). Her father Sami (Igal Naor) runs a gym and her brother Hayder (Tyler de Nawi) is a local champion. Yet Amirah isn’t interested in the university course her mother wants for her, nor the traditional path followed by females in her community. She has her heart set on training rising star Jess O’Connor (Keisha Castle-Hughes) in her professional debut. 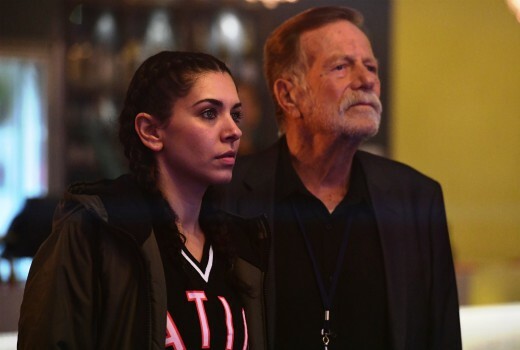 She convinces Sami’s long-time promoter (Jack Thompson) to stage a one-off event, but it soon puts her offside with her father. The authenticity of the script by Tamara Asmar runs deep through On the Ropes: from talking about the footy at the local mosque, to the importance of family and the high finances required to mount an immigration application. With consistent performances, including from a defiant Nicole Chamoun and Igal Naor, the experience is sincere without ever feeling contrived. Director Shannon Murphy (another female in a key role) handles the material artfully, notably playing with colour and light in the crucial boxing match scenes. SBS dramas always have a dynamic way of capturing urban Australia with grit. Keisha Castle-Hughes steps up for the fight scenes although her NZ accent is a frequent giveaway and it’s a shame Jack Thompson isn’t given more screen time (at least not in the opening chapter). Casting of her teen son feels a little old for this young mum. I can’t help but wonder if this may all be too niche to succeed beyond an audience already sympathetic to the issues it raises, but On The Ropes still shines a light into a world frequently hidden from view at a time when other networks have begun switching theirs off. On the Ropes airs 8:30pm Wednesdays on SBS. I will…looks good…set my Windows 10 reminder…Thank you.